Greetings again from the darkness. Pedro Almodovar is a fascinating filmmaker and one that I’ve followed consistently since his 1988 Women on the Verge of a Nervous Breakdown. Over that almost 30 year period, I have rarely felt let down by his work, and have quite often walked out of the theatre in awe of his artistry, creativity and dedication to providing original cinematic viewing experiences. The quite visually suggestive opening sets the stage for an Almodovar experience, only what follows is much different than what we have come to expect. It’s (somewhat) based on the short story trilogy of Alice Munro (Destino, Pronto, Silencio), and returns him again to his strength – telling the story of women. It may not be as flamboyant as some of his previous work, but rather it’s a pure and earnest emotional drama. It even has a bit of Hitchcockian flavor with the element of mystery playing a central role. Emma Suarez and Adrian Ugarte alternate in the role of Julieta and both are excellent. Ms. Suarez plays the older Julieta looking back on her life, while Ms. Ugarte populates most of the memories being entered into the journal … a writing effort designed to fill in the life gaps for her long estranged daughter Antia. We learn that Julieta fell in love with fisherman Xoan (Daniel Grao) while his wife was in a coma, and that Antia was conceived before the wife passed away. Xoan’s housekeeper Marian (played brilliantly by Almodovar regular Rossy de Palma) is one who knows a man has needs, but doesn’t always know when to speak and when to remain silent. One of her not so secret secrets is Xoan’s artist friend Ava (Imma Cuesta) who manages to get close to Xoan, Julieta and Antia. Ava is such an interesting character that a movie about her could have been equally entertaining. 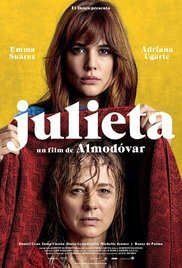 Other key players here are the older Julieta’s boyfriend Lorenzo (another Almodovar regular Dario Grandinetti) and Antia’s special childhood friend Bea (Sara Jimenez) who appears years later (as Michelle Jenner) in a quick appearance that rocks Julieta’s world. Guilt, death, love, disappointment, and relationships are all significant pieces to this Almodovar puzzle. Spirituality even pops up when Antia attends a retreat and makes her life-altering decision … one spurred by youth and vulnerability, and possibly leading to regret later in life. As Julieta recounts her life, we understand her middle-aged whole in the heart. She has “lost” everyone she has ever loved – her husband, her daughter, her mother. Cinematographer Jean-Claude Larrieu experiments with camera angles and captures the beautiful vistas and landscapes, while never losing the intimacy required for such an emotional journey. The color red is all over the film and almost jumps off the screen at times, ensuring that the visual element never is far removed from the drama. The score from Alberto Iglesias is excellent and quite a complement to another master work from Almodovar. This entry was posted on Thursday, January 26th, 2017 at 8:22 pm and is filed under Drama, World Cinema/Foreign. You can follow any responses to this entry through the RSS 2.0 feed. You can leave a response, or trackback from your own site.